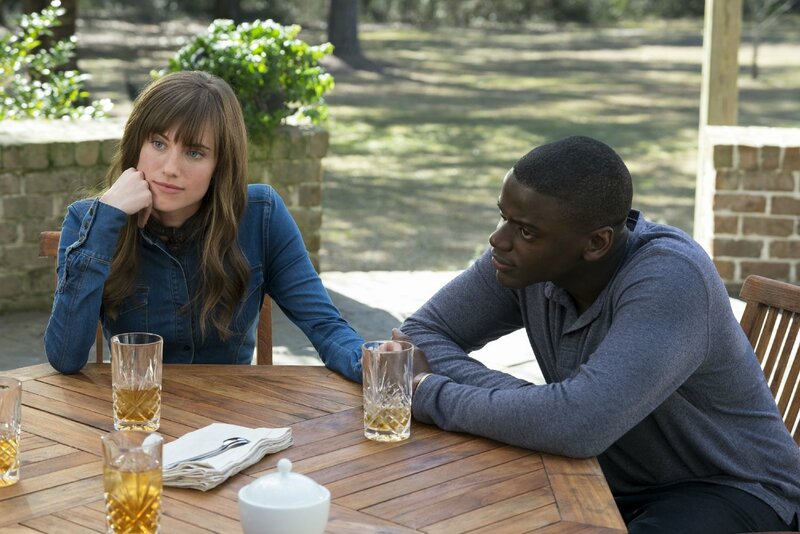 Rose (Allison Williams) brings her new boyfriend Chris (Daniel Kaluuya) home to meet her parents in Get Out. Peele is in the zone from the word go when it comes to crafting his film as a whole though. The opening sequence in which an unassuming young man (Lakeith Stanfield) walks the streets of a nice neighborhood while talking on his cell phone and is very critically in the midst of a light conversation delivers key context clues. We immediately sympathize with the character as he appears pleasant and anxious to see the girlfriend he is chatting with on the phone while not unaware of his predicament when a car begins to slowly follow him. A black guy walking the sidewalks of a suburban neighborhood late at night. He and we get how this might look. To those that aren't black or any other color than Caucasian that haven't felt as if they've been profiled due to factors having to do with everything but their personality it is hard to imagine a world where one has to be cautious of such things, but Peele is smart enough to recognize this and to immediately place us in that headspace before taking things to what we'd like to imagine is mostly an exaggerated extreme. The opening title sequence is a bit of brilliance in and of itself as well as the film cuts from the deliberately terrifying opening sequence to something very much in line with the horror genre-a camera moving quickly past endless, bare trees with a dark and ominous score hovering in between them before jolting us out of the mood and into our protagonists modern apartment where his photography skills are displayed through prints of gorgeous black and white portraits on the wall with the music switching to that of Childish Gambino's, "Redbone," in which the chorus warns to, "Stay Woke." The foreshadowing is not lost on the discerning viewer. By glimpsing these two very distinct tones, very distinct flavors by the time the opening credits have finished the audience is immediately steeped in the atmosphere the film intends to simulate and, for a first time feature director, Peele is able to expertly carry this tone throughout the entirety of his film; heightening it as the arc calls for it and executing plot lines effortlessly so as to bring everything full circle by the time the big reveal is made and further into what is one of the most breathtaking and satisfying denouement's in my movie-going experience. Our protagonist, Chris, is portrayed by British actor Daniel Kaluuya who you might have seen in Sicario, but here he is an American photographer who very intentionally fits the bill of average mid to late twenties male. There is nothing particularly exceptional about Chris, but he is clearly a well put together guy who has a good enough eye with his camera that he's been able to become fairly successful as a photographer. We meet his girlfriend of four five months, Rose (Girls' Allison Williams), as she does the whitest of white things and waits in line to buy overpriced coffee and pastries at what is no doubt a hip, local bistro before arriving at Chris' apartment to make sure he's all packed and pick him up before they hit the road. Neither of these leading roles seem as if they'll be much of a stretch or even too challenging for the two actors, but as the film progresses and the complexity of the bigger picture is made more clear it becomes all the more impressive what these two have been laying the foundation for since those aforementioned humble beginnings. 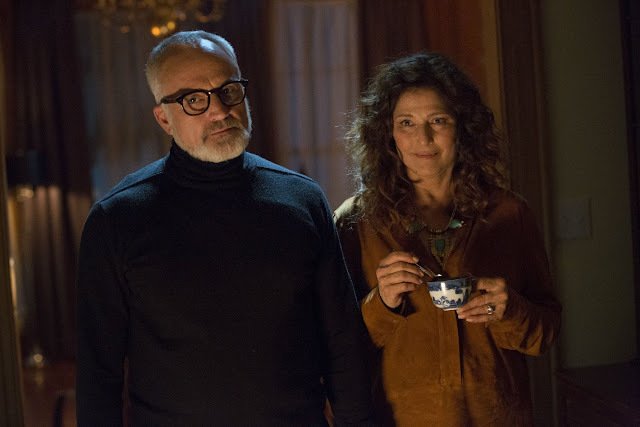 Add into this the delightful aura that Bradley Whitford brings to his character of the overcompensating dad who is trying to impress his daughter's new boyfriend as much as he is trying to impress him coupled with Catherine Keener's opposite end of the spectrum and it's as if one could feel the sense of unease in the air. And as mentioned previously, when Chris and Rose first arrive at the Armitage estate Peele uses the inherent delicate situation that presents itself as a means from which he draws the chills and tension before taking things to whole other allegorical levels. Aiding in this transition from a more reality-based scenario to that of the exaggerated heights Get Out eventually reaches though, is the fact the family employs black people as servants. Walter (Marcus Henderson) is the groundskeeper who, for one reason or another, likes to exercise in the pitch black of night while Georgina (a revelatory Betty Gabriel) is the maid. Both seem more subdued and willing to work and mind their own business than what would be typical of someone in a role such as these, but neither ever hint at anything that would contradict reality being more than it appears. Caleb Landry Jones, who can't seem to help but to play disturbed and psychotic young men, shows up as Rose's younger misfit brother who Whitford's Dean assures Chris will soon be following in his father's footsteps as a neurosurgeon. File in party guests that are never obvious in their racism, but don't realize the implied ill will in their sometimes downright lewd comments and there is more than enough to unpack when it comes to social constructs and racial profiling in the performances alone. Dean (Bradley Whitford) and Missy Armitage (Catherine Keener) solemnly swear they are up to no good. Furthermore, it is the writing of Peele that gives these performers such biting material to deliver and that, most impressively, stays consistent throughout the films entire runtime and most striking-through its faultless pacing. No matter how well the majority of horror films begin the trickiest part is always pulling off an ending in a way where every facet and action that has been laid out prior is paid off in the reveal and in the actions and consequences the characters take and are made subject to in the final moments. Does the end justify the means we took to get there? 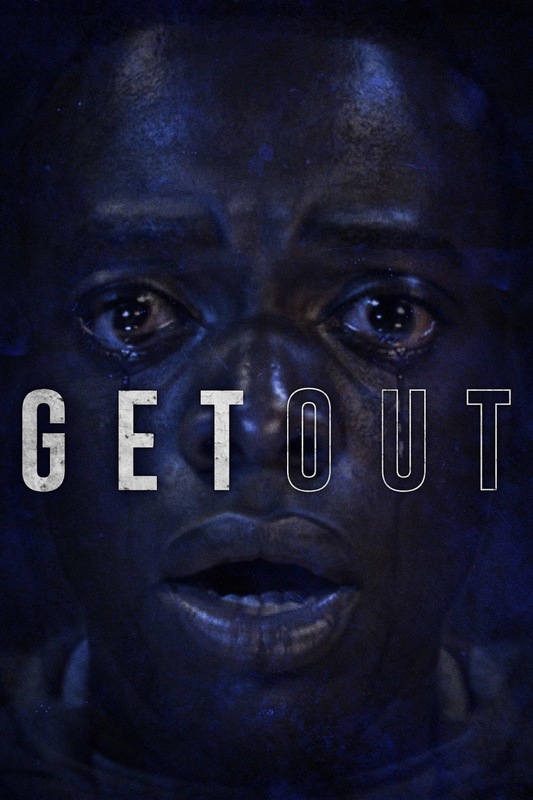 In Get Out, everything has a purpose. Early on, when Chris and Rose are on the road to Rose's parents something happens that is very much a cliché when it comes to horror films and my first inclination was to wonder how this might play into the story as a whole. As Chris especially is affected by the event we are made to wonder why this resonated so strongly with the character. It becomes a key part of not only why Chris behaves the way he does-from what habits he has formed to what action he feels he needs to take and not take in different situations-but also in lending the character a rare weakness and opening for Keener's Missy to take advantage of as she's (too) desperate to try out a hypnosis trick on this young man she just met. We see Georgina constantly messing with her hair only for that to be explained in a truly shocking turn of events. We meet Stephen Root as one of the only, seemingly level-headed guests that attend the Armitage's weekend get-together, but whose comments may or may not hide a deeper truth and envy than Chris interprets upon first speaking with him. As the film does, but almost unfortunately, draw to its conclusion it gives way to a single, throughline idea that is executed in flawless fashion. Everything lines up. Even the initially muddled objective becomes clear once it is explained through action rather than speech and is understood in a way that both makes sense, but is simultaneously even more revolting than one might have imagined when they couldn't quite wrap their head around it all two scenes prior. 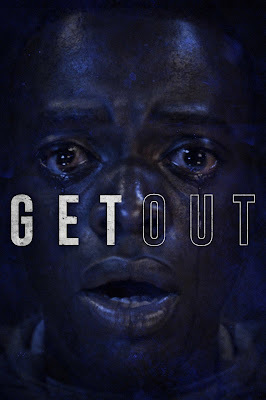 Get Out may not be necessarily scary in the traditional sense of how we expect horror/mystery movies to frighten us, but it is more disturbing on a much deeper level and one that is benefited all the more for being so. Not just in its success as a piece of art, but as a satirical social commentary that exposes the vicious circle of assumptions and prejudice Get Out works on nearly every level it attempts to play on. It is a great film. I can't wait to see it again. I can't wait to experience a different audience's reaction to it. I can't wait to discuss it even more.